We are heading into what is one of my favorite times of year. Not only is it time for the seasons to change and cooler fall weather to settle in, but it also marks the start of Oktoberfest. Each year, we play host to a time-honored German tradition. Starting Sunday, September 21st, we will be preparing the "area's most authentic" German fare each night after 4 pm while supplies last. 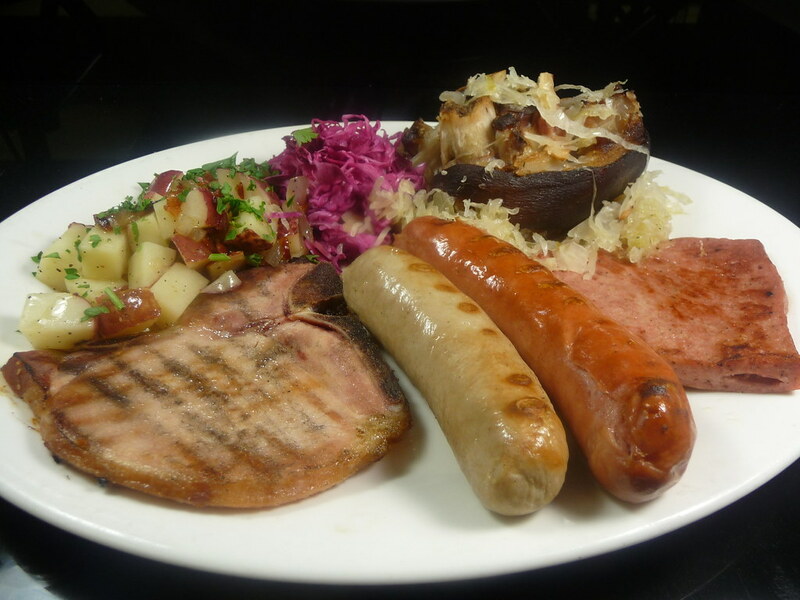 Come and enjoy a plate that is filled with traditional meats, sausages and sides, plus a stein of German beer. We will also offer a wurstsalat salad. This may be my all time favorite. This is a German salad that consists of knackwurst (German garlic sausage) tossed in a mustard vinaigrette. It is served over a bed of boston bibb lettuce with hard boiled eggs, grape tomatoes, red onion and fresh roasted beets. Just remember that the food is only half the experience. Enjoying a stein of authentic German beer is what makes the dish complete. This traditional deep golden lager with a creamy malty taste and mild sweetness is brewed at one of the six original Oktoberfest breweries. This light hop bitterness with smooth finish pilsener is the #1 selling draft beer in Germany. This original Bavarian style beer is produced at the oldest continuously operating brewery in the world, the Weihenstephan Monastery Brewery near Munich, Germany. This is a full-bodied golden wheat beer with hints of clove and, according to the brewmaster, a unique banana flavor. Oktoberfest is known as the largest fair and beer festival in the world. Dating back to Munich, Germany on October 12th, 1810, the 5-day event was originally staged to celebrate the marriage of the Bavarian Crown Prince Ludwig and Princess Therese of Saxony Hildburghausen. Today the event has extended to be a 16-day food and fun fest that boasts more than 6 million visitors each year who help consume more than 1 million gallons of beer and eat traditional German food favorites. We at the Uptown are proud to bring a slice of German history and festivities to the Illinois Valley, so come out and enjoy while supplies last!